4 person min. 6 person max. This boat has a capacity of 6 customers, the captain and the mate. Our boats are USCG inspected vessels and our captains hold a USCG Master License. Coast Guard approved life jackets and ear protection are provided for everyone on board the vessel. 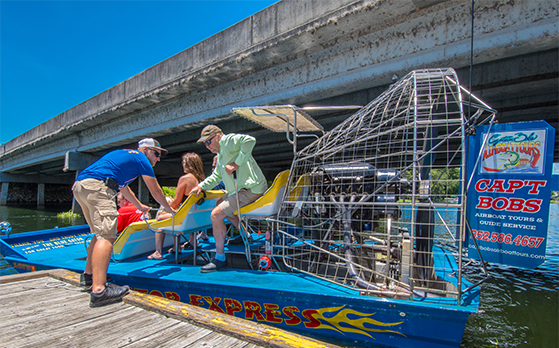 2015 18' Floral City Airboat 6.0 liter Chevrolet engine with 500 hp. Ready To Roll Down The River? Note: This is an appointment request form, not a guaranteed appointment. Upon receiving this completed form, an representative will contact you to confirm your actual appointment. © 2017 Captain Bob's Airboat Tours. All rights reserved.